This is why I watch bundles of horror movies, to find diamonds in the rough that surprise with a good story, good gore and and at least average acting. Stitches is an overweight alcoholic clown that despises children and lives in a trailer on the outskirts of Ireland. 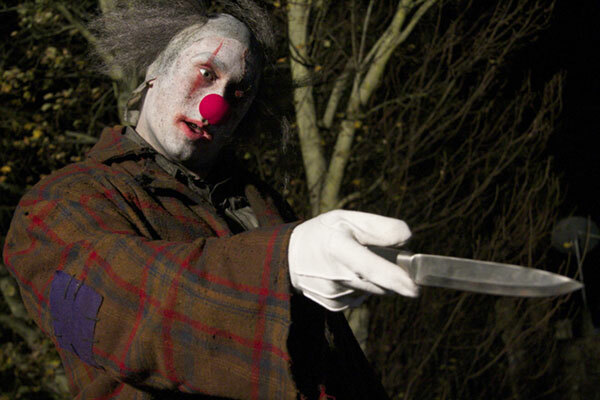 At Tommy’s 11th birthday party Stitches is being tormented by a group of snotty children who eventually end up killing him when they tie his shoelaces together and he face plants onto a knife. Later that evening Tommy is spying on the graveyard with his telescope and he sees a group of clowns laying stitches to rest. It is here where we learn the great secret: no clown can rest peacefully if he does not finish a party! Flash forward 6 years and Tommy and the rest of the brats are in high school getting ready for a party at Tommy’s house. It is here where Stitches gets his revenge as he hunts down the kids who tormented him one by one. This movie has everything you could ask for in a low budget horror film. The killer’s motivation makes sense and is not too far fetched. The victims are at a centralized location and there is an abundance of fresh meat. The kills are violent, evenly spaced, and unique. Examples include a guy getting his head soccer kicked off, and a kid getting his brains scooped out with an ice cream scooper. Most importantly however, the movie had a good pace. Most low budget horror films have way too much filler and down time. Stitches kept moving and kept the viewer engrossed throughout the film. Recommended if your looking for a really good, unique horror film.